Synopsis (c/o Barnes & Noble): "In order to develop a secure defense against a hostile alien race's next attack, government agencies breed child geniuses and train them as soldiers. A brilliant young boy, Andrew "Ender" Wiggin lives with his kind but distant parents, his sadistic brother Peter, and the person he loves more than anyone else, his sister Valentine. Peter and Valentine were candidates for the soldier-training program but didn't make the cut—young Ender is the Wiggin drafted to the orbiting Battle School for rigorous military training. Is Ender the general Earth needs? But Ender is not the only result of the genetic experiments. The war with the Buggers has been raging for a hundred years, and the quest for the perfect general has been underway for almost as long. Ender's two older siblings are every bit as unusual as he is, but in very different ways. Between the three of them lie the abilities to remake a world. If, that is, the world survives." To be completely honest, the synopsis pretty much tells you everything you need to know about this novel. Adding any more would give away too much of the plot and story line, so I'll keep my mouth shut and simply say that this is an attention grabber, and has a high probability of being politically motivated. That aside, it is a wonderful tale (even for me, and I'm not a large fan of sci-fi). It reminds me quite a bit of the idea of Hunger Games in that a child is too heavily relied upon, forced into adult situations at too young an age, and pulls through remarkably. If you like watching a character adapt to prove themselves capable of more than originally thought, this could be a novel for you...but honestly, you could probably stop at this one. The rest of the series gets a tad too monotonous. Very cool! Thanks for finding my blog! 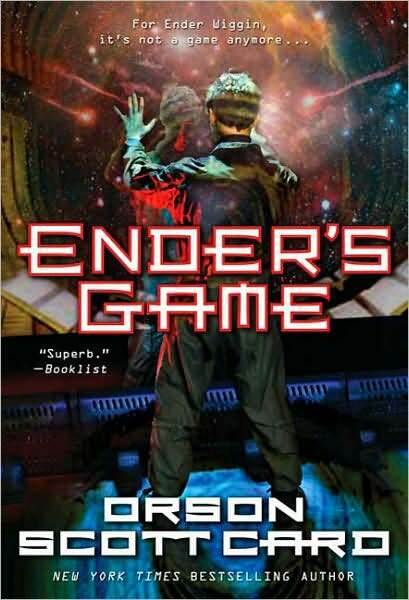 I actually just read Ender's Game on our leave in between Osan and Ramstein, and stayed up until around 4am finishing it. I am actually from Greensboro, NC, and waited on Orson Scott Card and his family, when they came into the restaurant where I was a waitress, when I was 16. I had to pick my jaw up off the floor when I saw his name on his credit card as he paid. :) Still haven't read Hunger Games, although I'd like to. I need to find a good book club here, or I'll go crazy.